A little club in downtown Dallas that books the most down and dirty bands you'll find. It's a 21+ place for most shows, so I suppose it's nowonder they pick the bands they do. The Granada Theater has a long history in Dallas, but not a whole lot in the way of Punk until recently. Since 2010 the Granada seems to be steadily booking more and more of the most legendary names in Punk. 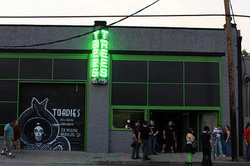 Notable bands that have played this venue: Bad Brains, The Adicts, and more.